Read more about extractors in the Confluence Extractor Module documentation. Click Add to save the search extractor. Now choose the search field at the top-right, type homePage : true and search. The search result returns the list of the home pages for all spaces. 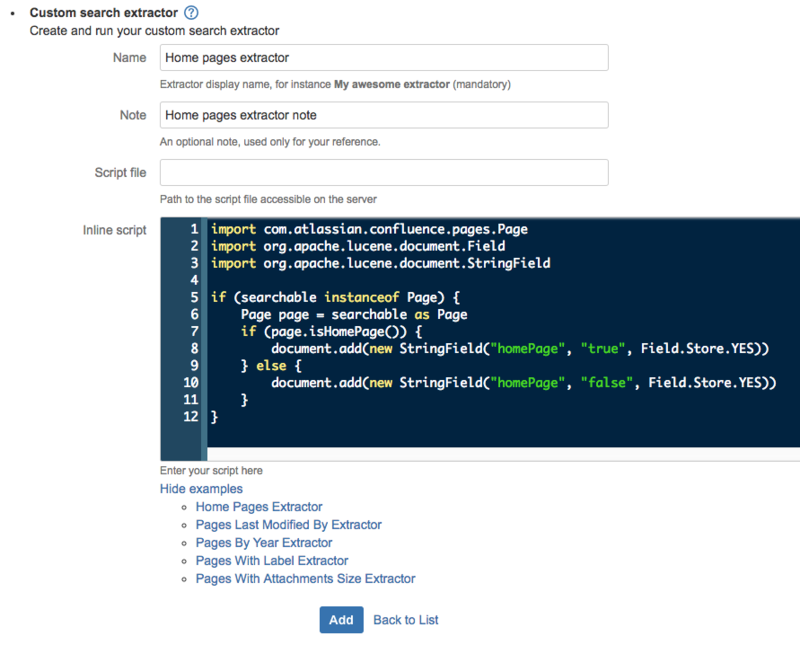 If you want the search result to return all the pages that exist in Conflunce, including those created before the extractor, then the Confluence search index has to be rebuilt. For more information on rebuilding the index, read up on Content Index Administration. Rebuilding the search index is a time consuming, expensive operation and should not be triggered in busy hours. All the examples are available under Admin → Search Extractors → Custom search extractor → Expand examples section. The extractor helps to return all the pages created in a year. 1 - Create an instance of Calendar. 2 - Set the time of our calendar to match the page’s creation date. 3 - Get the year the page was created. 4 - Store the year as a field in the Lucene document. 1 - Create a new Label "finance". 2 - if the page has the "finance" label, store that as a field in the Lucene document. The search string for this extractor is label : finance. This extractor helps to search all the pages with attachment more than 20 meg in size. 1 - Calculate 20 megabytes as bytes. 2 - Get all attachments for a page and get total size in bytes. 3 - If the total attachment size is large enough, store attachment with value 20 for the page. The search string for this extractor is attachment : 20. This extractor finds all the pages that were last modified by a specific user. 1 - Get the name of the last modifier. 2 - Store the modifier field with user name as it’s value. Use the Confluence username to do a search. For an example if user name is "rfranco" then the search string will be modifier : rfranco.